Flip Out Mama: Hot Gift: DaGeDar for Nintendo DS! Anyhow, this game is based of off this toy. There are over 100 different DaGeDar to unlock and race! The tracks are amazing, with tons of loops, jumps, stunts, etc. as well as a ton of obstacles to avoid. Tater really liked that you can play with friends or battle the bad guys alone! He was really into which DaGeDar he had unlocked and which ones he still needed to get. He also really liked the music in the game. I caught him dancing during the races several times! It was too funny! The game has thirty-three levels, and like I said before, over 100 DaGeDar to unlock, so I know that this game will be keeping him occupied for awhile! You can play against another person or play against the computer. Tater said he likes it much better when you play against another person. All in all, even though I don't understand this game, it is pretty cool. It reminds me a lot of Hot Wheels tracks that my brothers and I used to play with when I was little. Tater is really a big fan and I am glad that I got to learn a little bit about this game! 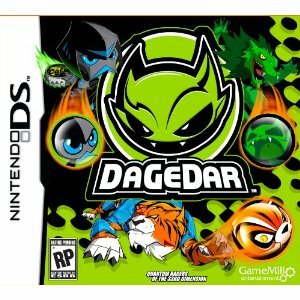 You can buy the DaGeDar game online at Amazon by clicking here! disclosure: I received a sample product in order to conduct this review. Although a sample was received, all opinions are my own and no monetary compensation was received.